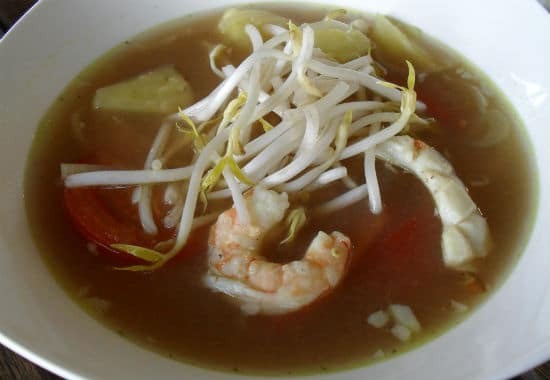 Pineapple Seafood Soup (or Canh Chua Tom as it is locally known) is a popular Vietnamese sweet and sour soup variety made with pineapples and mixed seafood. 1. Mix the garlic, red chillies, 1 1/2 tsp fish sauce and pepper powder in a bowl. 2. Add the seafood and mix until well coated. 3. Cover and keep aside for 10 to 20 minutes. 5. Cook the onions and lemongrass for a minute. 6. Add the chicken stock, tomatoes, pineapples and mix well. 7. Add fish sauce, tamarind extract, salt and sugar. 8. Stir well and bring to a boil. 9. Simmer for a minute and add the marinated seafood. 10. Simmer for another minute or two or until cooked. Add the beansprouts if using. 12. Garnish with coriander leaves and transfer to serving bowls. 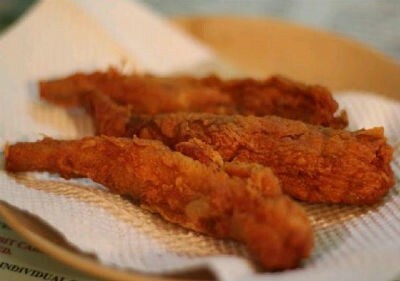 Tip: Add more fish sauce and tamarind extract if required at step #10. Feel free to comment or share your thoughts on this Pineapple Seafood Soup Recipe from Awesome Cuisine.